When a unit is under the direction of a charge nurse, service recovery is an important part of their role. Whether they are coaching other RNs or answering directly to the patient or family, charge nurses can directly impact the patient experience. The charge nurse’s ability to communicate and lead can have a significant impact on management, patients and staff. With strong clinical skills they raise the bar on patient care, but charge nurses aren’t always comfortable with the leadership side of their role. 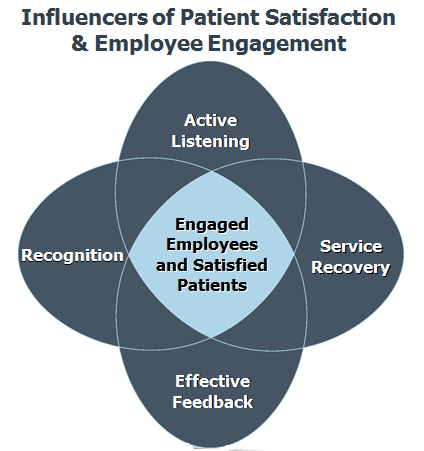 A focus on charge nurse development can improve employee engagement and patient care. Healthcare organizations that empower charge nurses to lead will achieve better results. Research has shown that frontline leaders like charge nurses play an important role in keeping team members engaged. They also serve as the first line of defense when there is an upset patient or visitor. These skills can be learned and strengthened through dedicated training. How well do you connect wi th your team? Are you comfortable offering feedback – both positive and constructive – to your teammates? Do your teammates feel as if their concerns are being heard? Do you observe signs of frustration? Do you effectively communicate with management regarding your team’s performance? Do you inform management of challenges and opportunities for recognition? Do you actively listen to patients? Do you make an effort to refer to patients by name? Do you make a conscious effort to avoid healthcare jargon when speaking with patients and their families?